Different kinds of strings can markedly adjust the sonic character of violins. Plain and wound gut, steel and synthetic strings offer timbres varying from mellow to bright with different degrees of stability and playing ease. 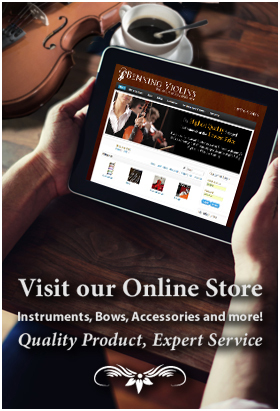 Because of the varying character of a violin string’s sound, violinists of different genres of music will have different preferences of materials of the violin strings they use. The earliest strings were made of catgut, another name for dried sheep or cattle intestines. “Plain gut” strings are still the preference in baroque-era music, offering bright timbres rich and lively in overtones. They are not easy to keep tuned, and are damaged sooner than their counterparts. Catgut is usually the most expensive type of string. Metal windings were first used in the 16th-Century to avoid the flabby sound of looser, lower-pitched gut strings, their width making them harder to play or fit into the peg box. Copper or silver wire makes a thinner gut heavier and therefore lower in pitch. 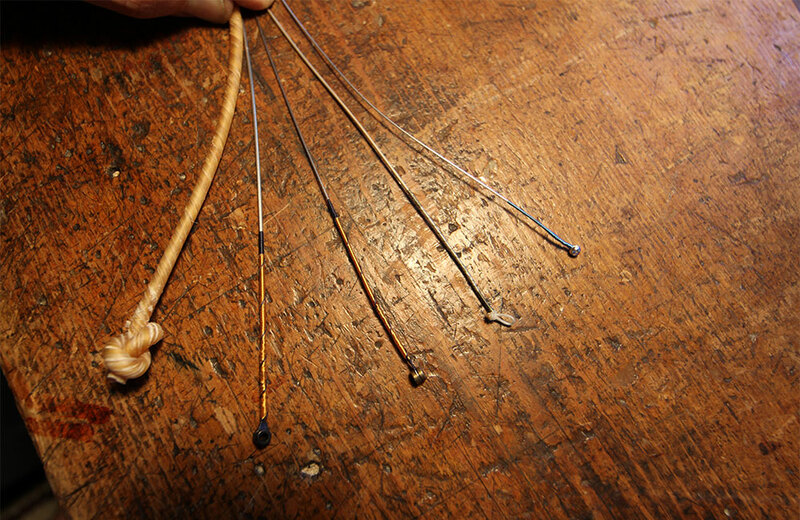 Different materials of windings influence strings’ sound. Wound gut strings are considered more difficult to keep in tune, due to the different reactions to heat and moisture between the windings and core. Invented in the 1970s and more common nowadays, wound strings with a synthetic core allow thinner width while retaining the desired pitch, making the string easier to play. Perlon, a type of stranded nylon, retains the tonal qualities of gut while lasting longer, staying tuned and responding less dramatically to weather. Wound synthetic strings often produce a similarly mellow sound as gut with metal windings. Country fiddlers prefer the sound of a steel core, either solid metal or of braided or twisted filaments. Steel strings have a bright, clear sound, less tonally rich and considerably cheaper in price. Gold or aluminum plating delays corrosion of a raw steel E string. All of the above rules and observations pertain equally to viola and cello strings.